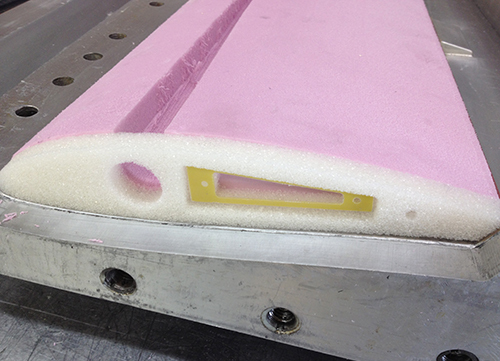 Carbon by Design has developed several captured foam technologies for our customers. This process is especially useful in lightweight structures with core materials ranging from 1.3 lb/cu. ft to 10 lb/cu. ft densities. The trapped foam is used as a consolidation mechanism during the cure cycle and to prevent oil canning after the cure of structures with laminate thicknesses as thin as .008 in. 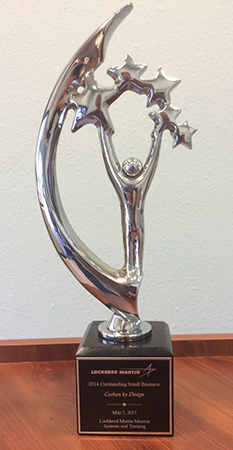 In some applications where weight is the primary concern the foam can be removed with a chemical milling process after the cure cycle is completed. Depending on the application foam selections include polystyrene, Rohacell, and EPP foams. 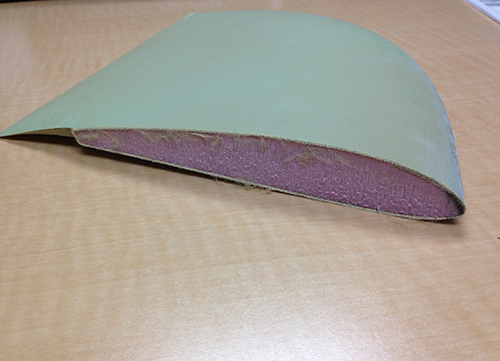 An example of a completed trapped foam wing assembly which has been subsequently section cut. The foam has expanded during the cure cycle consolidating the Kevlar and Carbon plys.